where a is another constants of integration. Eq. (18) expresses the trajectory of an Archimedean spiral (see curve on the left of Figure 16). So far there is no restriction on whether the movement is to plunge inward or to expand. The value of b determines the winding of the spiral. As b = dr/d is the relative rate of change between r and , a small value of b makes the winding very tight and vice versa. The solution also admits another spiral arm with - or 180o out of phase (see curves on the right of Figure 16). 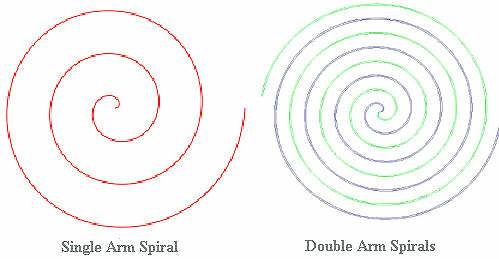 With variation of orientation at r 0, the spiral assumes a broad sweeping pattern much like the hurricane in Figure 15 instead of one slim locus. The sign of b, i.e., b > 0 or b < 0, has the effect on the winding direction - whether it turns to the left or right. For the barred spiral like the Milkyway in Figure 14, the constant a > 0, while a = 0 is for the case of true spiral galaxy such as NGC2997. 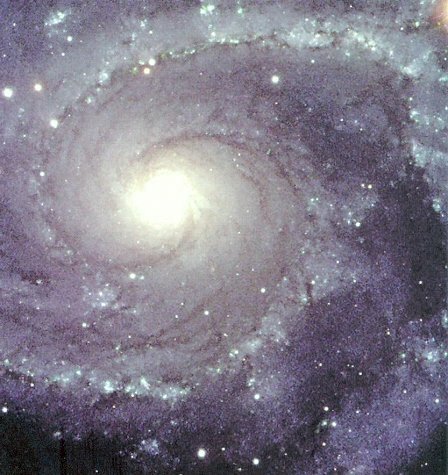 It turns out that the formation of spiral arms in galaxy is more complicated than this simple minded approach, which would produce tightly wound spirals (within 500 million years) in contrary to observation (see more in Theory of Spiral Arm Formation). ur2 / r = Fr ---------- (19a). 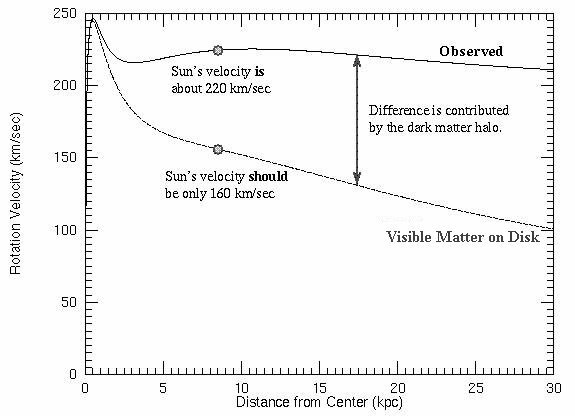 which has the same profile of the rotation curve for the disk as shown in Figure 17a with a peak at rm (4 0r0b/M) b for 4 0r0b >> M. The observed curve takes into account of the dark matter in the halo. (4 0r0b/M) 33 - enough to qualify for a peak in the rotation curve. The calculated rotation and radial velocities at r0 are: r0 u 122 km/sec, and ur 0.06 km/sec respectively. At the event horizon of the central black hole rs 2GM/c2 matter plunging into the hole with radial velocity ur c / 21/2 (where c is the velocity of light), but the rotation velocity reduces to rsu 4 km/sec. 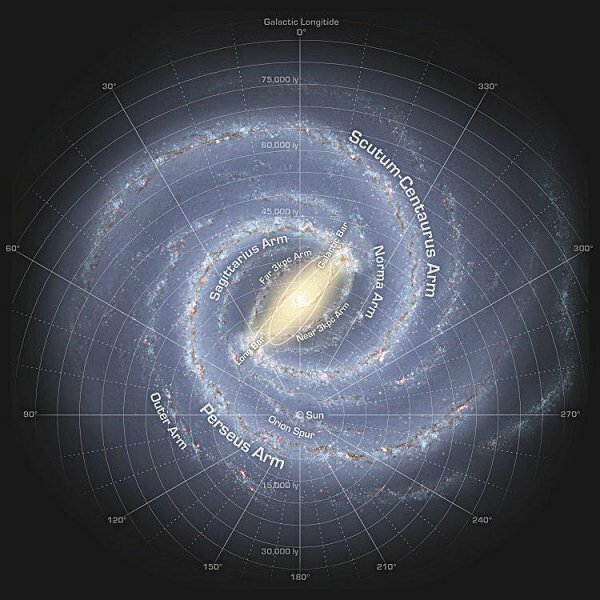 To check the winding of the Milkyway spiral arms, it is noticed that the rotation velocity is in the order of 100 km/sec for a wide range of distance outside the core. Following this simplification, the spiral arms wind through a cycle of 360o in about 600 million years. Thus, it can be estimated from Eq. (17) that the change in the radial position of the arm is about 0.1 kpc. 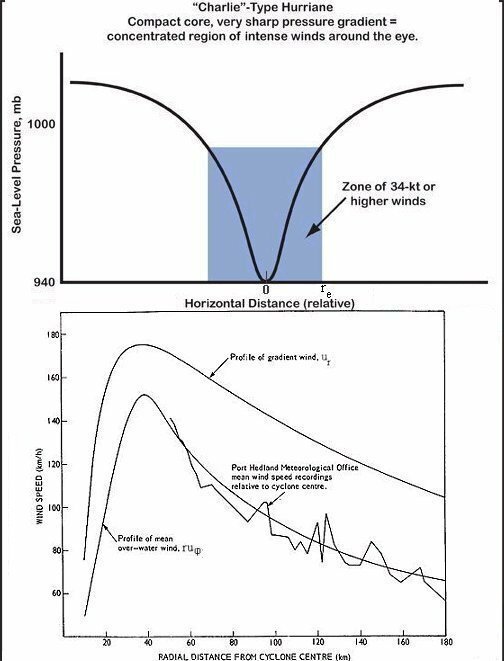 The observed separation of the arm from = 0 to 2 as shown in Figure 14 is about 20 kpc. This is obvious a contradiction, and that's why the simple spiral flow in galaxy from fluid dynamics consideration alone is at best a toy model as mentioned earlier. ur2 / r = (1/ ) dp/dr ---------- (20). ur2 = (krp0/ ) e-k(r - re) ---------- (23) for r re. At the wall of the eye, r = re, and ur2 = krep0/ . The rotation curve is given by r2u 2 = (kr3p0/b2 ) e-k(r - re), which reproduces a profile similar to the curve in Figure 17b with a maximum at rm = 3/k. 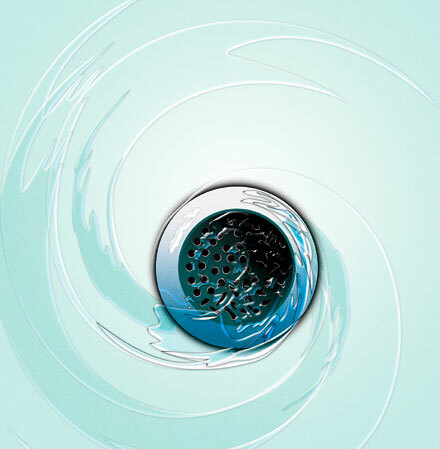 This kind of analysis is also applicable to the drain in the sink although on a much smaller scale. and ur/(reu ) 2 at re. b = [ur/(reu )] re 20 km. Thus the radial distance changes by about 125 km covering about 2/3 of the average hurricane size when turns one cycle. There is no tightly wound arms. This model seems to represent the actual system quite well. 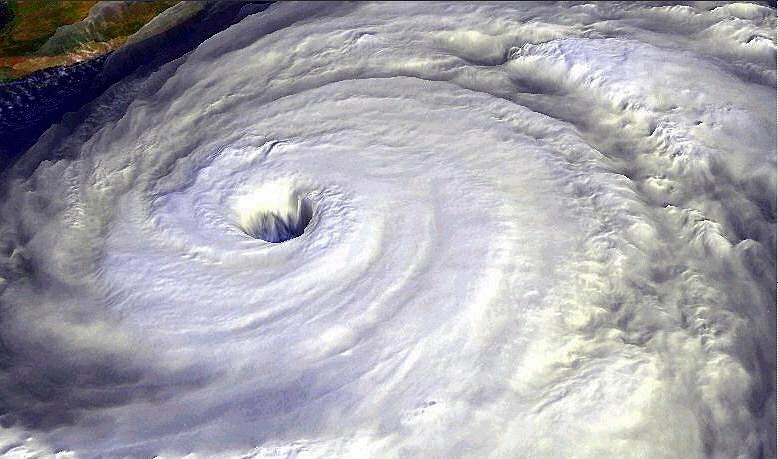 Meanwhile, the calculated radial and circular velocities at the wall of the eye are ur 4.6 m/h and reu 2.3 m/h respectively indicating a calm region there. 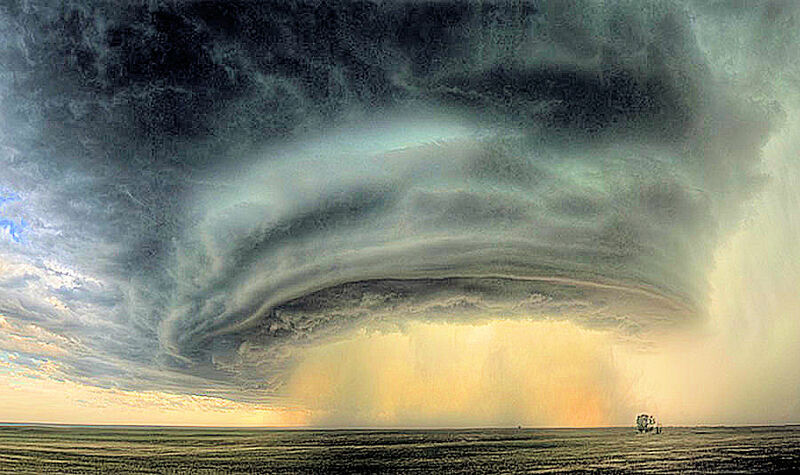 Figure 17c is a vivid example from a small scale hurricane (a thunderstorm supercell) over Montana, USA showing the wall, as well as the dark cloud spiralling inward.